Crispin Guest is a disgraced knight, stripped of his rank and his honor - but left with his life - for plotting against Richard II. Having lost his bethrothed, his friends, his patrons and his position in society. With no trade to support him and no family willing to acknowledge him, Crispin has turned to the one thing he still has - his wits - to scrape a living together on the mean streets of London. Medieval noir - what a concept! 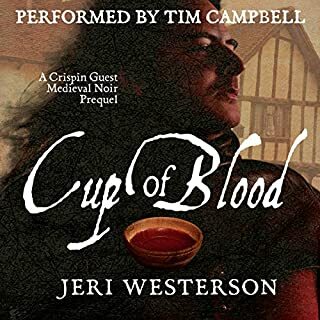 When a corpse turns up at his favorite tavern, Crispin Guest-disgraced knight turned detective - begins an inquiry, but the dead man turns out to be a Templar knight, an order thought to be extinct for 75 years, charged with protecting a certain religious relic which is now missing. 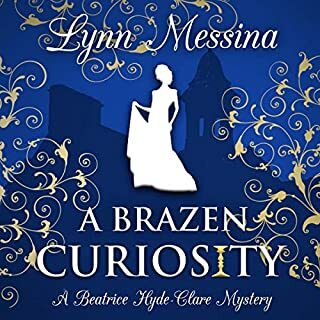 Before he can begin to investigate, Crispin is abducted by shadowy men who are said to be minions of the French anti-pope. Late summer, 1270. Although the Simon de Montfort rebellion is over, the smell of death still hangs over the land. In the small priory of Tyndal, the monks and nuns of the Order of Fontevraud long for a return to routine. Their hopes are dashed, however, when the young and inexperienced Eleanor of Wynethorpe is appointed their new prioress. Only a day after her arrival, a brutally murdered monk is found in the cloister gardens, and Brother Thomas, a young priest with a troubled past, arrives to bring her a more personal grief. King Edward IV trembles as he decides the fate of his sibling. And Richard, Duke of Gloucester tries to find a way to save George from being put to death by their eldest brother, the King. So when the Duke sees his loyal servant Roger the Chapman at his trial, he recognises that he has a chance. In late 14th-century London, disgraced former knight Crispin Guest spies a body hurtling from the uppermost reaches of London Bridge. Crispin’s attempted rescue fails, however, and the man - an armorer with a shop on the bridge - dies. While whispers in the street claim that it was a suicide, Crispin is unconvinced. He discovers that the armorer had promised Sir Thomas Saunfayl something that would make him unbeatable in battle. Sir Thomas, a friend from Crispin’s former life, believes that the item was in fact the Spear of Longinus - the spear that pierced the side of Christ on the cross - which is believed to make those who possess it invincible. Complicating matters is another old friend, Geoffrey Chaucer, who is suddenly eager to help Crispin find the missing spear...and locate Sir Thomas, who must face a trial by combat to determine whether he lives or dies. 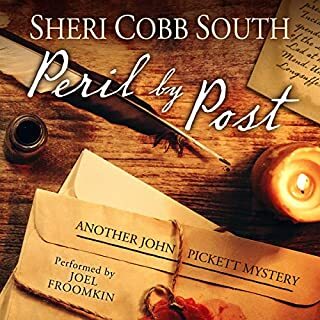 Desperate to help, Crispin, along with his faithful apprentice, Jack Tucker, hunt for the spear while dodging the various powerful factions determined to have it for themselves. Through danger and trials, Crispin finds that the safety of England may have landed solely in his hands. ©2012 Jeri Westerson (P)2012 Brilliance Audio, Inc. 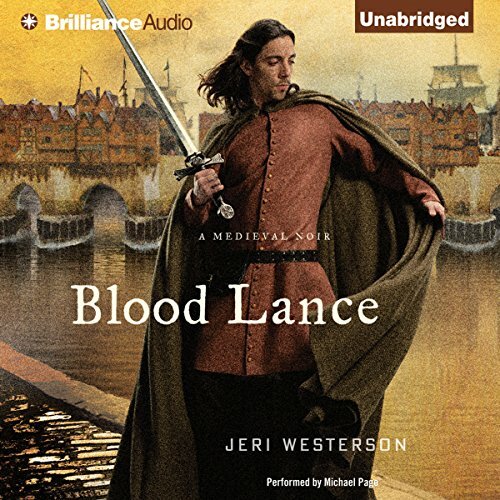 I love this series, and was thrilled to find that they decided to produce an audio edition of Blood Lance, but unfortunately they started out of sequence, but fortunately this novel can stand alone. 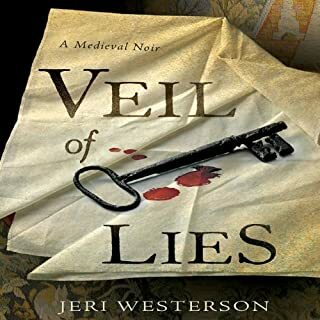 Once again Jeri Westerson takes you there, to the mean streets of 14th century London. It is one of her strengths and it is one of the things I have come to respect about her writing. 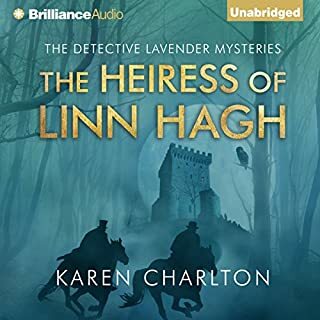 In Blood Lance, Crispin (a disgraced knight, who is making his living as a tracker, aka sleuth,) is his usual self, a sucker for a pretty face and honorable to a fault. I don’t think I will be spoiling too much since Ms. Westerson has blogged about exploring PTSD within this story line, and I think she did a marvelous job showing that this could not have been a phenomenon of modern warfare. Jack is back as Crispin’s mother hen, and side kick. I truly love their relationship. There are great twists and turns, and I thought I had everything figured out, but as usual the final twist proved me wrong. There is a great jousting sequence and I think it was very well imagined and written. Chaucer is back, and keeps you wondering just who he serves. In this fifth book in the series, Crispin Guest is a little better off, Jack Tucker is his apprentice, and a baffling murder/suicide(?) open the story. Sir Thomas Saunfayl, a former friend from Crispin's days in the Duke of Lancaster's army, turns cowardly. He flees to England and seeks a religious relic, the Spear of Longinus, which was used to pierce Christ's side at his crucifixion. Saunfayl needs the spear to make him invincible when he undergoes trial by combat to avoid execution. As usual there are twists and turns along the way, and the joust for the trial by combat is very effective. It reveals Crispin's integrity and Saunfayl's true character. The location of the spear is pretty ingenious. The dangerous streets and neighborhoods, the palaces, and the cathedrals are as much characters as Crispin. There's a fun video of the series on the author's web page - check it out. The historical notes at the end of each book reveal more information on the historical characters, the time, and the religious relics. There's an interesting comment on Saunfayl's cowardice as possible evidence of Post Traumatic Stress Disorder (PTSD). The psychological side effects of war have been present throughout history. The disorder has just had different names in different wars. I can't wait for the next book, Shadow of the Alchemist, which is currently scheduled for release 13 October.